Basically this is a new old Pickup day. The guitar almost in original state, i replaced recently the 3 way switch since the original one was noise and problematic on switching to the neck pickup, after upgrading pickups in my 1st guitar this one was played a lot less, and still has the original string, they where dark now. Why does the TonePros bridge comes with some grub screws to lock it in place, oh well i had some PC Case screws that fitted in there and where not to big. The original pickups come with springs glued in a stiff sponge base to allow a small amount off height adjustment. The BKP legs have to be modified to fit inside the pickups cavity since the ends off the legs are not rounded, also the screw hole needs to be enlarged to use the original wood pickups screws. 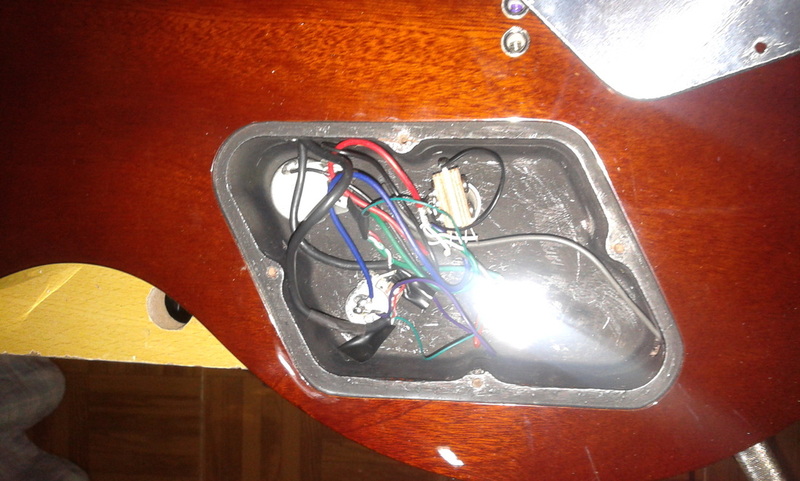 After i undersold the old pickups and install the new pickups and solder every thing, i tested the guitar without any strings, every thing appeared fine. So i placed a new set off string in it and tested it again. Tested the bridge and it sounded like the old bridge pickup, what in the hell?!!?? 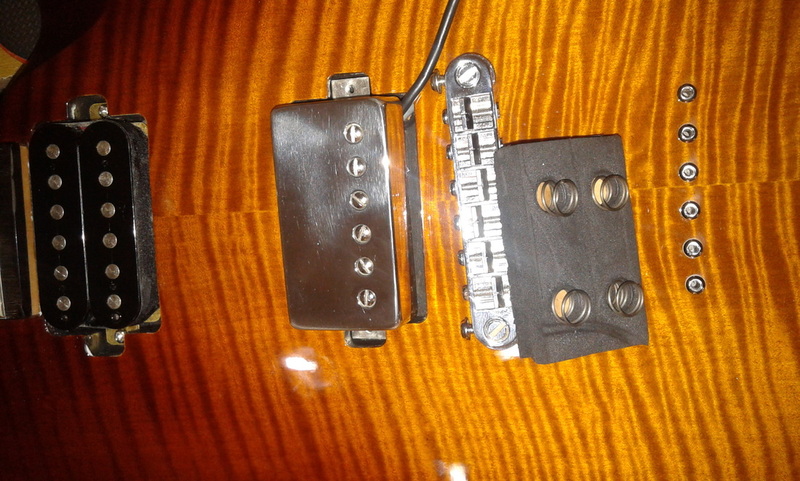 Tested the neck pickup, dam that's hot! I measured the resistance off the pickups since they used and the only other clue off the pickups placement was the length off cable. The bridge resistance matched the specs and its in the bridge, and by cable length it can not be the other way around. Moved the bridge volume a bit, did the same to the neck and they felt slightly different. After replacing the pot for the bridge with a old used pot i had still left the problem was solved. So the pots will be changed both in the near feature. 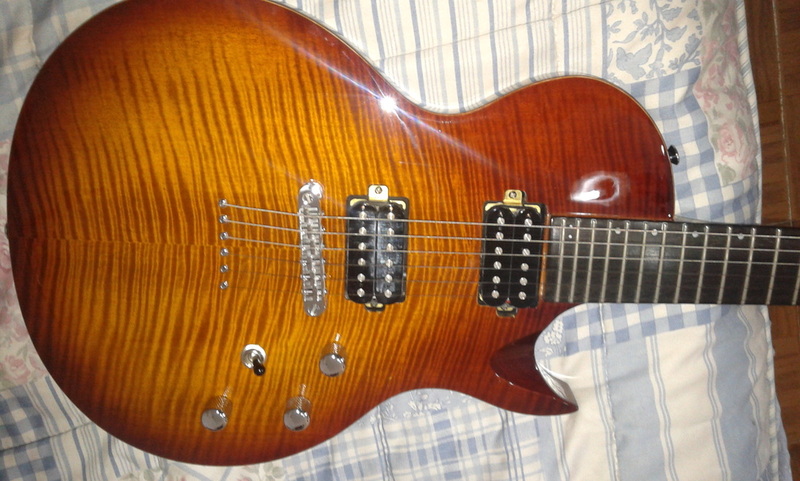 The guitar with new pickups, new strings. 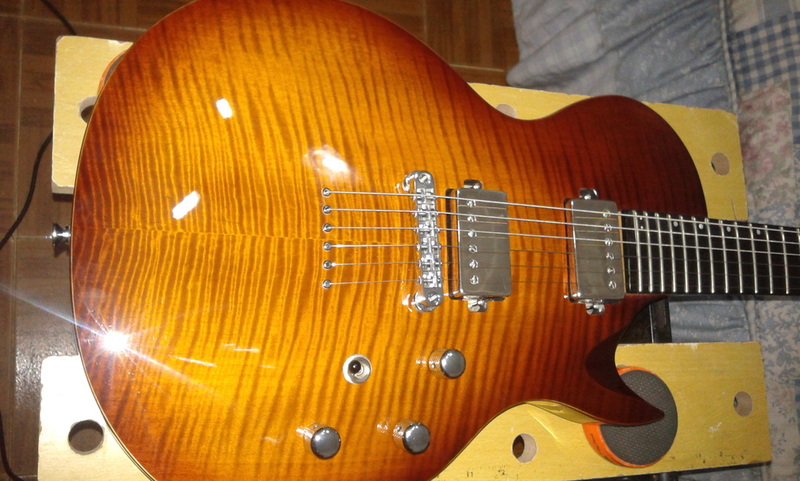 The fret was also clean and oiled up, and the guitar polished a bit.